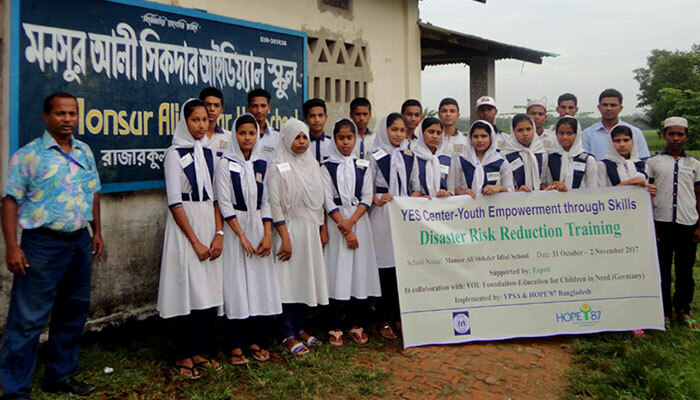 YES Center – Youth Empowerment Through Skills Project run by YPSA and Hope87 Bangladesh Consortium, organized a three-day long training workshop on Disaster Risk Reduction for the school students at Ramu Upazila under Cox’sbazar District. 20 students, 10 of them boys and 10 of them girls, of seventh and ninth grade of Monsur Ali Shikder Ideal High School at Rajarakul Union participated in training workshop. The program was inaugurated by the headmaster of the school, Abdul Hasem and presided over by Mohammad Hossain Nuri, Assistant Head Teacher of Monsur Ali Shikder Ideal High School. 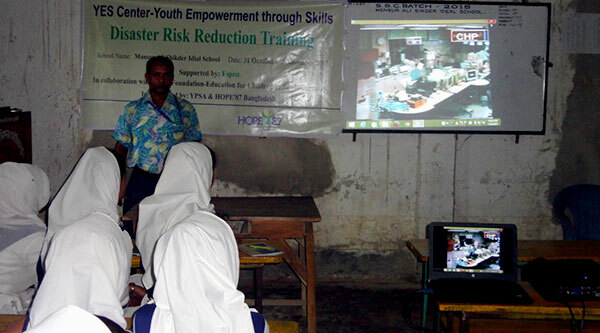 A, K, M, Monirul Haque, Project Manager, was the chief facilitator of the training. “The training on the disaster risk reduction conducted by the YPSA YES Center has benefited our students, they will participate voluntarily as a conscious citizen of the society to work for disaster risk reduction. This is what YPSA and school authorities expect of them to do.” Said headmaster of the school at the end of the training workshop.